In looking over images of Pluto’s informally named Venera Terra region, New Horizons scientists have spotted an expanse of terrain they describe as “fretted.” As shown in the enhanced-color image at top, this terrain consists of bright plains divided into polygon-shaped blocks by a network of dark, connected valleys typically reaching a few miles (3 to 4 kilometers) wide. Numerous impact craters of up to 15 miles (25 kilometers) in diameter also dot the area, implying the surface formed early in Pluto’s history. New Horizons scientists haven’t seen this type of terrain anywhere else on Pluto; in fact, it’s rare terrain across the solar system – the only other well-known example of such being Noctis Labyrinthus on Mars. The distinct interconnected valley network was likely formed by extensional fracturing of Pluto’s surface. The valleys separating the blocks may then have been widened by movement of nitrogen ice glaciers, or flowing liquids, or possibly by ice sublimation at the block margins. 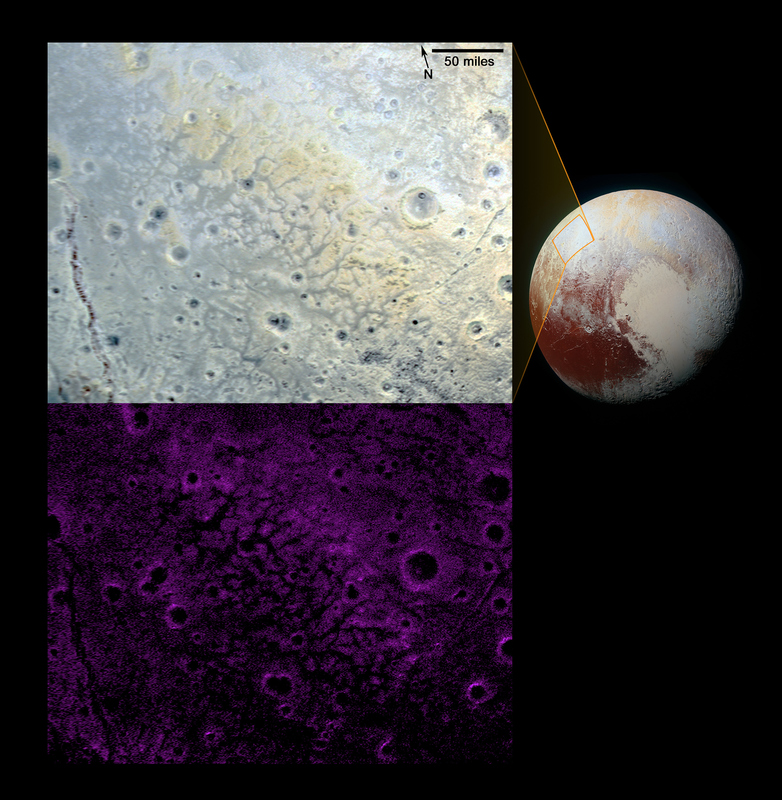 Compositional data from New Horizons’ Ralph/Multispectral Visible Imaging Camera (MVIC), shown in the bottom image, indicate that the blocks are rich in methane ice (shown as false-color purple); methane is susceptible to sublimation at Pluto surface conditions. The resolution of these MVIC images is approximately 2,230 feet (680 meters) per pixel. They were obtained at a range of approximately 21,100 miles (33,900 kilometers) from Pluto, about 45 minutes before New Horizons’ closest approach on July 14, 2015.